We’d love your help. Let us know what’s wrong with this preview of The Broken Girls by Simone St. James. To ask other readers questions about The Broken Girls, please sign up. ??? I have a weird, but legit question... how come there is 481 reviews for this book and it's not even release yet ??? Am I missing something here ??? Pam Last month, This book was a selection for book of the month, which is an online service (like a club) that lets you pick one of 5 new releases each…moreLast month, This book was a selection for book of the month, which is an online service (like a club) that lets you pick one of 5 new releases each month for 14.99. They have exclusive rights sometimes (apparently) to get copies before they go on sale to the public. 5 new titles are offered at the first of each month. That is how I was able to read this book before it was even released. I was born & grew up in VT so don't you think I should win a copy of this book? Fonda Rush Only if you are randomly chosen, just like the rest of us. Faster, faster. Don’t let her catch you. I’m not usually one for paranormal/ghost stories, but when I read the description for “The Broken Girls” I was really intrigued. I’m thrilled to say that this was even better than I expected. Barrons, Vermont - November 1950. A young girl has just gotten off a bus. She has two choices. She can take the normal route or she can cut through the woods to get there faster. But cutting through the woods means leaving the safety of the main road. Suddenly she turns and sees a figure coming towards her. But how is this possible? She was the only one who got off the bus…. Katie, Ce-Ce, Roberta and Sonia are roommates at Ildewild Hall, a boarding school for “troubled” girls. Over time they have become close friends. They bond over their painful life stories. They trust and depend on each other. We are given insight into why each “broken” girl is at Idlewild though chapters from their perspective. We learn about their lives and what they’ve been through and about the mystery surrounding them all. Fiona was seventeen at the time of her sister’s murder. Twenty years later, unanswered questions continue to plague her. Although a man was convicted for her murder and is serving his sentence in a maximum-security prison, he has always maintained his innocence. And now Idlewild Hall is being restored. Why would someone bother re-building a place like Idlewild? Fiona decides to write about the restoration for the local paper. She has strange feelings whenever she is near the property and the old school. Is it possible that the rumors about Idlewild being haunted are true? Then a shocking discover changes everything. Could there be a link between what happened all those years ago and Fiona's sister’s murder? There are so many secrets surrounding Idlewild and Fiona is determined to find out what those secrets are. But could all of her investigating end up putting her in danger? The story alternates between 1950 and 2014. The chapters in 2014 are told from Fiona’s point of view. The chapters in 1950 are from the point of view of the four roommates. Though it alternates and there are quite a few different perspectives, I thought it flowed easily back and forth between past and present. “The Broken Girls” was a unique and impressive novel. While I did find the beginning of the novel a bit slow, it wasn’t long before I was completely caught up in the story. It was an engrossing read that really struck a chord with me. I ended up reading more than half of the book in just a few hours. You can tell that the author has done her research; she brings everything together in an excellent way. Though some parts are dark and disturbing, I feel the author handled these difficult subjects with respect and sensitivity. “The Broken Girls” was a captivating read that I really enjoyed. I’m looking forward to reading more from Simone St. James. Thank you, Berkley Books for providing an advanced readers copy of this book for me to read in exchange for my honest review. 5 SHINY STARS, I would give a lot more if I Could. Mary Hand Mary Hand, Dead and buried underland. She'll say she wants to be your friend. Do not let her in again. The setting is in Vermont. There are rumors that the boarding school Idlewild Hall is haunted. This is a place where girls go who are troublemakers, illegitimate and too smart for their own good. Their parents rarely visit them. Four roommates are friends and they bond very well until one of them disappears. Fiona Sheridan is a journal 5 SHINY STARS, I would give a lot more if I Could. Fiona Sheridan is a journalist. Twenty years ago her sister's body was found lying in the overgrown fields, near the ruins of Idlewood. Her sister's boyfriend was tried and convicted of murder. She keeps revisiting the events surrounding her sister's death. Fiona has a strong suspicion that the case isn't what it was made out to be. Fiona then finds out that Idlewild Hall is being restored and decides to write a story about it. Shockingly she discovers that the renovations link to secrets that were meant to stay hidden in the past. This is an awesome spooky ghost story plus a great mystery. It is so much more than your average ghost story. If you usually don't like ghost stories, I still think you would like this one. It is a Gothic suspense novel and I could just feel the Gothic atmosphere brewing. It is more of a mystery than horror. It didn't really scare me but the secrets were frightening but more suspenseful. It was also very chilling. It hooked me in straight from the beginning and didn't let go until the very end. The suspense kept me turning the pages and kept me reading into the earl hours of the morning. The story goes back and forth from the past to the present. From 1950 to 2014, two stories merge into one. There are several twist and turns that gave me surprises that I didn't see coming with a great murder plot. The book is very well written and is a character driven novel. I just loved some of the characters. I recommend this to those who like a Gothic suspense novel. 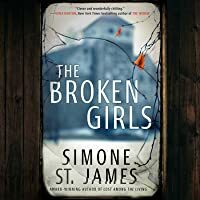 The Broken Girls by Simone St. James is a 2018 Berkley publication. Now THIS is my kind of book!! Set in Vermont, alternating between 1950 and 2014, this well rounded thriller, centers around a girl’s only school named Idlewood Hall. During the fifties, this school was where troubled girls were sent, and where a group of girls forge an unlikely and formidable friendship which would cause a rippling effect for decades to come. Over the years, the abandoned school was nothing more than an eyesore The Broken Girls by Simone St. James is a 2018 Berkley publication. Over the years, the abandoned school was nothing more than an eyesore, protecting its memories and ghosts from the outside world, its most recent claim to fame being the general location of where Fiona Sheridan’s sister was found dead over twenty years ago. Now, in present day, 2014, someone has taken an interest in Idlewood, determined to restore the old boarding house, which only intensifies Fiona’s obsession over her sister’s death. She convinces her boss to allow her to do a story about the school's restoration for the magazine she works for. While she barely manages to conceal her ulterior motives, the restoration efforts inadvertently led to a shocking discovery, and sends her down a rabbit hole, as she searches, not only for peace of mind concerning her sister’s death, but for the answers to a decades old mystery. This gloomy, atmospheric thriller enveloped me in its Gothic fog, keeping me utterly riveted and on the edge of my seat from the beginning to end. The creepy aura surrounding Fiona’s investigation into her sister’s death is nail biting suspense at its finest. This is a crime drama, thriller, and chiller all rolled into one. While the haunting of Idlewood adds a deliciously spooky element to the story, what is truly haunting is the heavy toll that losing a daughter and sister had on Fiona and her family, as well as the ever present feeling of impending doom. But, the mystery of the disappearance of one of Idlewood’s boarders during the fifties was a story that goes beyond the ghostly rumors. It is poignantly sad and infuriating tale, that slowly morphs into an inspirational and touching story of friendship and long overdue closure. I have always been a sucker for a good ghost story, mainly because contrary to the creepy, spooky, chilling aspects of hauntings, more often than not, ghosts are quite often helpful, or asking for help from the living, to give them long sought after peace, which is a not at all frightening when you look at it from that angle. This story is no exception, but I have to tell you, this ghost story packs a powerful punch and is incredibly edgy!! But, mostly, this story is about solving all the mysteries surrounding two very different types of crimes, with two entirely separate circumstances. The author manages to connect the past to the present fluidly, despite the stark differences in themes and urgency. While the location and Idlewood provide a physical link, it is really the power of familial love and the enduring bonds of friendship, with a little help from beyond, that brings everyone and everything together in the end. This story is evenly paced, giving the well timed twists a great deal of power. It is very well written, and embodies everything I love about a good thriller. Overall, this was an immensely satisfying read. There’s something sinister at work in Barrons, Vermont at the abandoned Idlewild Hall. Ghosts have been seen, bodies have been found, and secrets have been long buried. When a journalist begins digging into the dark, dismal history of Idlewild, she exposes a web of corruption and hidden crimes. In the 1950’s four girls were roommates and the best of friends at Idlewild Hall, a boarding school for “troubled” gir LOVED! In the 1950’s four girls were roommates and the best of friends at Idlewild Hall, a boarding school for “troubled” girls. The girls are the closest of friends and rely on each other to survive living in the repressive, gloomy, world of Idlewild. When of them goes mysteriously missing, the school believes she has run away, but the friends believe that she was murdered. Switch to 2014: When journalist Fiona Sheridan learns that Idlewild, which had been shut down and abandoned, is going to be restored she is determined to find out more, as Fiona has an inherent interest in Idlewild as it is the spot which her murdered sister’s body was found 20 years ago. The more and more Fiona digs up about Idlewild, the more she puts herself in danger. The Broken Girls is an intelligent, well-written creepy, atmospheric read that I could not put down! There’s something about Simone St. James’ writing style that sucked me in--I honestly had to force myself to put this book down. The characters voices are compelling, and their stories equally interesting. I loved the eerie, gothic like atmosphere, and of course Mary Hand’s presence kept me on edge. There are some paranormal elements, which I normally would have rolled my eyes at, but they serve a purpose and really work in this book. I cannot say enough good things about The Broken Girls! I might just have to go reread and experience it all over again! The Broken Girls is part paranormal story, part mystery and I enjoyed how Simone St. James blended the two together. I was actually surprised by how much I enjoyed the ghost aspect of the story. The story unfolds via two separate storylines, set decades apart. At the center of each storyline stands Idlewild, a home for troubled girls. In 1950, a girl gets off a bus and goes missing. The only people who are convinced something is wrong are her roommates. Fellow troubled girls, Katie, CeCe and Roberta, know Sonia didn't just run away but no one cares enough to really investigate. Years later in 2014, Idlewild is set to be reopened. Journalist, Fiona Sheridan is drawn to the land as it is where her older sister was found murdered 20 years before. She decides to write about the restoration for a local paper and uncovers so much more than she bargained for. I was engrossed by the storyline and all its secrets. The mysteries of the deaths of these two girls with the added layer of a ghost haunting Idlewild kept me turning the pages. I really enjoyed the 1950's storyline and found each of the girls' backstory interesting. Their bond was touching and I appreciated their friendship in light of all the hardship they suffered. A dark, haunting novel that includes a whopper of a ghost story. When I first sought out this book I had no idea the plotline involved a supernatural element. Had I known, I probably would have just passed on it. And boy, what a shame that would’ve been. In fact, the supernatural slant ended up being my favorite part of the book! So even if ghosts tend to scare, (like they do for me👻) don’t run! It blends perfectly into the story. The book is split into two timelines. Past and present. Interestingly, I was completely captivated by the past timeline and left wanting more. Versus the present storyline, that I found more difficult to stay connected to and felt it just didn’t mesh with the feel of the rest of the book. Overall I found it to an enjoyable read and would recommend! This was a very large and engaging Traveling Sister read! Thank you to Edelweiss for an ARC to review. The Broken Girls proved to be a breezy and exciting read in all of the best ways. The hooks were there, pulling me further and further into the story until I became one with it. Until the hours and pages flew by alike and I realized I’d finished it all in one sitting. Who isn’t intrigued by the thought of “throw away” girls from a time long ago? Simone St. James makes her own literary footsteps in shoes she fills well, for The Broken Girls is most definitely Ruth Ware meets Fiona Barton with an American Northeast twist. If that line wasn’t enough to tell you exactly what to expect here, I’ll elaborate. This novel reminded me of an equal cross between and The Widow and The Lying Game from the very start. The writing style is very similar—fluid and paced so that the read flies by breezily, tinged with intrigue. Even the theme of camaraderie among boarding school girls—their mischief, their backstories, their own haunting pasts—investigated in present-day scenes by a character who also has skin in the game, is the same. Here, you can even cozy up to the same scenery: wide open fields ringed with thickets of trees and old dirt gravel roads of the past. These novels were all cut from the same cloth, though they all told their stories in a way of their own. While so many thrillers suffer from too many ideas in the plot, The Broken Girls weaves together a handful of story lines with just the right recipe. A chase here, a haunt there—a thrilling journey to the end—all brought to a boil and served up heartily leaving me full and satisfied in the end. None of the story lines felt overpowering or underdeveloped; they all fit together hand in hand, seamlessly drawing me back and forth between two periods of time over sixty years apart. Because of this skillful flow, St. James’ Girls read at a quick pace, allowing me to immerse myself in the story without interruption. That’s half the battle with a thriller, right? I was most impressed with the handling of the ghost story here in this novel. It was brilliantly done, haunting me as it haunted those four girls—never overdone or melodramatic, relying on parlor tricks like flashing lights and other theatrics; this ghost was a leading lady all her own and deserving of the space she occupied with those pages. The Broken Girls started off with a bang and with a dynamically engaging prologue! Was there a ghost right from the start? In Vermont in the 1950s, there’s a home for wayward “throw-away” girls at Idlewild Hall. The local town has rumors that Idlewild is haunted. Four girls are sharing a room, and they forge a deep bond that continues to grow until one friend disappears. Also in Vermont, but in 2014, Fiona Sheridan is a journalist obsessed with events around her sister’s mysterious death. Twenty years prior, she is fond in the fields of Idlewild Hall. It turns out that Idlewild is being restored by someone who does not want to be named, and Fiona decides to write a story about it. Fiona discovers something that links her sisters death to other secrets...and something you’d never expect. Told in dual story lines, past and present, that later converge, I found the past timeline slightly more interesting, which featured a boarding school in Vermont for “wayward” girls in the 1950s. I enjoyed the present storyline with Fiona, too, but the former held me captive. The girls in the school were each so interesting and likable. Overall, this was a well-written, atmospheric, spooky ghost story, and one I enjoyed immensely. It’s the perfect read for this time of year, to cozy up with a blanket and fall into a story. A seriously atmospheric, creepy, spooky, eerie (seriously, think of a synonym for any of those words and it will fit the bill) tale that will haunt you day and night. I am not one for supernatural books, but this one was SO well done, it had me believing in ghosts by the time I was finished. So well done, in fact, that I went and bought this author’s entire back catalogue of titles. Mary Hand is a fascinating character and her powers are definitely unique. I loved her storyline, and would have en A seriously atmospheric, creepy, spooky, eerie (seriously, think of a synonym for any of those words and it will fit the bill) tale that will haunt you day and night. I am not one for supernatural books, but this one was SO well done, it had me believing in ghosts by the time I was finished. So well done, in fact, that I went and bought this author’s entire back catalogue of titles. Mary Hand is a fascinating character and her powers are definitely unique. I loved her storyline, and would have enjoyed learning more about her history. I thoroughly enjoyed this dual timeline story, I think this structure worked really well for this book. I was totally invested in these characters and couldn’t wait to find out what happened to them. This was a Traveling Sisters read and I thoroughly enjoyed the thoughts brought to the table by my friends. A very enjoyable experience! I thought it was great!! This book exceeded my expectations in every way possible. I went into this knowing two things: prep school for girls + mystery. Upon reading, I pleasantly discovered there is a lot more to this story than that. The novel is replete with a gothic atmosphere that transports you in time and space into the story. It is the perfect blend of mystery thriller with extra special paranormal goodness sprinkled the whole way through! The main portion of the story alternates back and forth between 1950 and 2014, following different girls and women in and around Barrens, Vermont, and more importantly Idlewilde Hall. I do not want to say too much about the plot, as I wouldn't want to risk giving anything away to potential readers. Just know this, I certainly wish I hadn't put off reading this book for months. I don't know why I did that. I can't explain it. It just kept getting shuffled down the ole' tbr. Now, I can say, I am physically distraught at not having read this as soon as I got it. This book is incredible. This book wants you to read it. This book will keep you up nights after. READ IT! "Mary Hand, Mary Hand, dead and buried under land.... Faster, faster. Don't let her catch you. She'll say she wants to be your friend...."
What a bloody brilliant story! The Broken Girls by Simone St. James is a creepy, chilling, and BOLD ghost story. Oh my gosh... I absolutely loved how Simone created a mystery within a paranormal/ghost story. I have read previous novels where authors have tried to create a paranormal feel to the mystery/thriller and it failed miserably but wow... I am utterly "Mary Hand, Mary Hand, dead and buried under land.... Faster, faster. Don't let her catch you. She'll say she wants to be your friend...."
What a bloody brilliant story! The Broken Girls by Simone St. James is a creepy, chilling, and BOLD ghost story. Oh my gosh... I absolutely loved how Simone created a mystery within a paranormal/ghost story. I have read previous novels where authors have tried to create a paranormal feel to the mystery/thriller and it failed miserably but wow... I am utterly impressed with Simone's talent. What can I say about this novel? Plain and simple... READ it! Idlewild Hall is a boarding school for girls that are troublemakers or as you can say the "leftovers". Idlewild is located in Vermont and is rumored to be haunted by a woman in a black veiled dress. Katie, Sonia, Cece, and Roberta are roommates at Idlewild Hall who bond over this mysterious lady in black and the strange things that start happening at Idlewild until Sonia mysteriously vanishes without a trace in 1950. 20 years later journalist Fiona Sheridan can't stop thinking about her older sister's death. Twenty years ago, Fiona's sister's body was found lying in the field of Idlewild Hall. Her sister's boyfriend has been found guilty and is serving time in prison. But, Fiona can't let her sister's case go and something isn't adding up. Is the death of her sister somehow linked to the missing girl Sonia in 1950? What secrets are being hidden about Idlewild Hall? Is Vermont hiding something more sinister about these mysterious girls that keep going missing? Simone does an amazing job with characterization and depth of illustration in this novel. I could not get enough of the beautiful writing and details in this creepy and chilling ghost story. I highly recommend this novel! Overall, 4.5 stars for this addicting read. Thank you to Netgalley and Berkley for an advanced arc in exchange for an honest review. 3.5 A storyline fifty years apart. A deserted school for girls, a school that in the fifties, housed girls that had problems. Four become fast friends, and then one goes missing never forgotten, but never seen again. A murder in more current times, body found on school grounds and a sister who wants answers. Now a wealthy woman is undertaking a renovation of the school, opening and exposing old secrets. Oh yes, and we must forget the ghost!! The atmosphere, spooky, gothic, tense, the definite sta 3.5 A storyline fifty years apart. A deserted school for girls, a school that in the fifties, housed girls that had problems. Four become fast friends, and then one goes missing never forgotten, but never seen again. A murder in more current times, body found on school grounds and a sister who wants answers. Now a wealthy woman is undertaking a renovation of the school, opening and exposing old secrets. Oh yes, and we must forget the ghost!! The atmosphere, spooky, gothic, tense, the definite star of this novel. Fast paced, quite a page turner, constant revelations. Did like the past story more than the present one, which is often the case with these dual storylines. the atmosphere though kept me immersed, and in fact found this entertaining, until the last quarter where it just became too muddled. Too much happening, too many coincidences thrown in the mix, and then the writing faltered. Hence, my rating which for most of the book would have been higher just for the enjoyment factor. This was a sisters read, one which we all enjoyed in varying levels. Quite a good discussion ensued. I don't believe in ghosts in real life, but I absolutely believed in the ghost of Mary Hand haunting a girls' boarding school, even after it was shut down in 1979. The writing of Broken Girls is wonderful and unique. The story is told during two diferent periods in history. In 2014, journalist Fiona Sheridan, daughter of a famous journalist, is still looking for more solid information on the murder of her sister twenty years earlier, even though Deb's boyfriend was convicted and has been imprison I don't believe in ghosts in real life, but I absolutely believed in the ghost of Mary Hand haunting a girls' boarding school, even after it was shut down in 1979. The writing of Broken Girls is wonderful and unique. The story is told during two diferent periods in history. In 2014, journalist Fiona Sheridan, daughter of a famous journalist, is still looking for more solid information on the murder of her sister twenty years earlier, even though Deb's boyfriend was convicted and has been imprisoned since her body was found in a field at Idlewood Hall in a remote part of Vermont. In 1950, we get to meet four roommates, girls abanoned because they were born outside of marriage or they're orphans or their parents just didn't know how to deal with the challenges of raising a spirited daughter, especially at a time when we don't have the knowledge about mental health that we do now (and therefore it was shameful to not be sunny and agreeable at all times if you were female). I loved these four fifteen-year-old girls. When one of them goes missing, neither the police nor the teachers do much to investigate. She's a throwaway girl. Her friends, however, know that she was murdered because she'd never run away. Fiona's search for the truth makes for an intriguing and enjoyable mystery. I really liked this book, which RELEASES MARCH 20, 2018. Thanks to NetGalley and Berkley Publishing for the opportunity to review this book. The Broken Girls was a quick, entertaining, fast-paced and atmospheric gothic mystery novel that was an enjoyable and satisfying read. I did enjoy the dual storylines, but I thought that the past timeline was a little more interesting than the present one though. I do love a good ghost story and the supernatural and I definitely thought the author delivered a spooky read here, but for some reason when I was reading this novel, I wasn't overly impressed with the author's prose though so 3.5 stars! I do love a good ghost story and the supernatural and I definitely thought the author delivered a spooky read here, but for some reason when I was reading this novel, I wasn't overly impressed with the author's prose though so that really affected my total enjoyment for this novel. I was the only one from the Traveling Sisters that was reading this that had a problem with that though so I still absolutely recommend this novel! Update: Thank you so much to NetGalley, Berkley Publishing Group, and Simone St. James for also providing me with a copy of this book to read and review. Thank you so much to Edelweiss for the advanced copy of this book! Coulee: a term applied rather loosely to different landforms, all of which refer to a kind of valley. 4.5 stars! I loved the gothic and mysterious feel of this gripping novel! From page one, I was drawn into this fascinating story surrounding Idlewild Hall, an old crumbling abandoned girls boarding school. In the 1950’s, an Idlewild Hall student disappeared, leaving for a weekend family visit, never to return. Almost fifty years later, a local girl is left dead in the open field surrounding the abandoned property of Idlewild Hall, the school having closed down decades prior. Add into the story th 4.5 stars! I loved the gothic and mysterious feel of this gripping novel! From page one, I was drawn into this fascinating story surrounding Idlewild Hall, an old crumbling abandoned girls boarding school. In the 1950’s, an Idlewild Hall student disappeared, leaving for a weekend family visit, never to return. Almost fifty years later, a local girl is left dead in the open field surrounding the abandoned property of Idlewild Hall, the school having closed down decades prior. Add into the story the numerous sightings of Mary Hand, a ghost known to haunt the property. The novel is presented in dual timelines which flowed perfectly. We meet four roommates living in Idlewild Hall in the 1950’s. I loved each and every one of them! In 2014, we follow freelance journalist Fiona Sheridan on a trail to uncover long buried secrets hidden at Idlewild Hall which has now been purchased and is in the midst of being renovated. A big thank you to Edelweiss, Berkley and Simone St. James for providing an ARC in exchange for an honest review! Wow, this book blew me away! It had everything I love in a book, amazing believable characters, smooth flowing prose, mystery within mystery within mystery. The past and present narrative style works wonderfully in this book and I was equally interested in both parts of the book. In Barrons, Vermont there was a private school called Idlewild Hall for “troubled” girls. This could range from those who had suffered mental and emotional trauma, girls that just didn’t fit the right mold, girls fathere Wow, this book blew me away! It had everything I love in a book, amazing believable characters, smooth flowing prose, mystery within mystery within mystery. The past and present narrative style works wonderfully in this book and I was equally interested in both parts of the book. In Barrons, Vermont there was a private school called Idlewild Hall for “troubled” girls. This could range from those who had suffered mental and emotional trauma, girls that just didn’t fit the right mold, girls fathered by someone who wanted to hide these “other” offsprings to just girls who didn’t behave in the way their parents wanted. In the 1950’s there were four very special girls who, living as roommates, struck up a friendship as a way to survive this horrible school and the constant repressive and stagnant nature of teaching. The girls, Cece, Katie, Sonia and Roberta have at one time or another spotted the rumored ghost of Idlewild hall, a mysterious lady veiled, and in black dress. They also hear her say things to them which is personal to each of them. When one of them goes missing, the others try to solve the mystery. Flash to 20 years later and the long vacant school and property have been purchased and is rumored to be planned to reopen as a school once again. A young journalist, Fiona Sheridan, is grief stricken at the this thought. Her older sister had been found strangled in the field by the school, her boyfriend being found guilty of the crime and currently in jail. Some things just aren’t adding up for Fiona and with the help of her policeman/boyfriend and fellow journalist she starts to dig and dig for more information about her sister’s death and also the person who has purchased the land and why. There was never a dull moment in this book, I really didn’t want to stop reading. The characters were all beautifully well developed and I cared about all of them. I highly recommend this book to anyone who enjoys a wonderful, brilliantly written book that will keep you guessing until the satisfying end. An eerie ghost story set in Vermont. Two timelines (1950 and 2014) merge to unfold a haunting tale with plenty of spine tingling revelations. A boarding school for troubled girls in 1950, conceals secrets that are begging to be told. The foreboding rhyme of Mary Hand is whispered through the walls. One of the four bonded roommates disappears and the others are left afraid and worried for their friend. It’s 2014 and Fiona has questions about her sisters murder, although it has been twenty years. He An eerie ghost story set in Vermont. Two timelines (1950 and 2014) merge to unfold a haunting tale with plenty of spine tingling revelations. It’s 2014 and Fiona has questions about her sisters murder, although it has been twenty years. Her body was found nearby the school and she has some of her own suspicions. What is the story behind Idlewild Hall, Mary Hand, and Fiona’s sister? Is it too late for the truth to be revealed? I hate to give it the “meh” but that’s how this book was for me. The audio is very good though. Most people enjoyed this book way more than I did so don’t take my word for it. I wish it didn't have to end................This is my guilty pleasure style novel. I loved the gothic, mystery feel to this book and my only regret on this one is that I don't actually own a hard copy for my real life book shelf. Broken Girls is a chilling murder / suspense story set in Idlewild Hall, an old abandoned boarding school in rural Vermont. I am a sucker for gothic or modern gothic style stories and throw in an old abandoned Manor or Boarding school with a mysterious past and a haunti I wish it didn't have to end................This is my guilty pleasure style novel. I loved the gothic, mystery feel to this book and my only regret on this one is that I don't actually own a hard copy for my real life book shelf. Broken Girls is a chilling murder / suspense story set in Idlewild Hall, an old abandoned boarding school in rural Vermont. I am a sucker for gothic or modern gothic style stories and throw in an old abandoned Manor or Boarding school with a mysterious past and a haunting tale and you got me from page one. I enjoyed the suspense with this one and couldn't wait to pick it up each evening and loved how the story is told in two time frames ( 1950s & 2014) which works perfectly for this story. Great characters that well interesting and likable and a couple of them I am having a hard time parting company with now that the book is over. I think readers who enjoy novel's like the or kate Morton's The House at Riverton may well enjoy The Broken Girls. What a great and captivating book! On the 1950s timeline we have a group of friends who are attending a boarding school called Idlewild Hall. They are devastated to learn that one of their close friends has mysteriously disappeared without a trace and, to make matters more intriguing, the school grounds are said to be haunted. On the 2014 timeline we have Fiona, whose sister was murdered twenty years ago and dumped on Idlewild. Fiona is still struggling with her sister's murder and she becomes un What a great and captivating book! On the 2014 timeline we have Fiona, whose sister was murdered twenty years ago and dumped on Idlewild. Fiona is still struggling with her sister's murder and she becomes unsettled when she learns those grounds are being restored. Fiona starts an investigation and we take a thrilling journey with her. The story is narrated by multiple characters and the timeline alternates between the 1950s and 2014. I had a great time with this book, it was engaging, thrilling, and a pleasure to read. The novel has elements of mystery, thriller, history and female friendship. Overall, I loved it and highly recommend it to readers of historical and contemporary fiction, mysteries and thrillers. A deliciously creepy story that's a bit gothic, heartwrenching, and completely absorbing. Stories involved the supernatural are a hit or miss with me, and I'm glad this one was a hit. The supernatural parts are not overdone at all, enough to be spooky and leave you wanting more, while being easy to imagine. I actually jumped at some point when my reading was rudely interrupted by a knock! This story has two timelines, 1950 and 2014. I found the older to be more my style, but they were both inter A deliciously creepy story that's a bit gothic, heartwrenching, and completely absorbing. Stories involved the supernatural are a hit or miss with me, and I'm glad this one was a hit. The supernatural parts are not overdone at all, enough to be spooky and leave you wanting more, while being easy to imagine. I actually jumped at some point when my reading was rudely interrupted by a knock! This story has two timelines, 1950 and 2014. I found the older to be more my style, but they were both interesting to read. In 1950, Idlewild Hall is a home for girls. Whether they just didn't have family or their family didn't want them or couldn't handle them, it's a place girls can be sent and practically forgotten about. They're all damaged and hurt in their own way, though some put on a front. The girls of 4C and formed a special bond. They have many differences, but they look out for each other and care for each other. They have a lot to deal with... not only their checkered pasts, but life at the boarding school. ....And then there's Mary Hand. Mary Hand is something of a legend among generations of Idlewild Girls. Many have claimed to see her. Some have heard her speak. Some have been shown things. One thing is for sure: once you meet the ghost in black that haunts the grounds, you will never forget her. In 2014, the dilapidated school and grounds have been purchased after many years sitting empty and alone. The town usually gives it a wide berth. Not only does it just give one a bad feeling, twenty years ago the body of a young woman was found there. Journalist Fiona Sheridan lost her big sister that night, and she's never been able to let it go. When she learns the school is going to be rebuilt and no doubt games will be played on the very spot where her sister once lay, she gets the idea to write a story about it. She feels the need to learn more about the place where her sister died. This was a really enjoyable read and a great book to read with the Traveling Sisters. I found it to be captivating and had a lot of fun trying to guess where it was going. Definitely recommended to anyone looking for a mystery that's emotional and a bit spooky. I was lost in the spooky overgrown weedy brushes of the lush coulee with ten of my Traveling Sisters. This was one of our largest group reads that we have done and it was such a great, fun read. I really enjoyed discussing everyone’s thoughts on this one. Interesting with such a large group we ended up in the same coulee but were split into different sides of the coulee. The Broken Girls is a creepy gothic, suspenseful, supernatural thriller that pulled us deep into the weedy brushes along with I was lost in the spooky overgrown weedy brushes of the lush coulee with ten of my Traveling Sisters. This was one of our largest group reads that we have done and it was such a great, fun read. I really enjoyed discussing everyone’s thoughts on this one. Interesting with such a large group we ended up in the same coulee but were split into different sides of the coulee. The Broken Girls is a creepy gothic, suspenseful, supernatural thriller that pulled us deep into the weedy brushes along with this interesting and entertaining story. We all settled in under the sun and soon things started to get a little dark. Our hair started rising as shivers ran up our backs as the wind howled down on us in the coulee. Simone St. James does a good job creating an interesting atmospheric setting here with the vivid descriptions of Idlewild Hall a creepy, eerie abandoned boarding school that was like a character itself. We all enjoyed exploring the ruins along with Fiona and the eerie feeling it left us. We loved being taken into the past when the school was open to troubled girls and we meet four interesting damaged girls all with their own conflict. We learn their dark and tragic backstories and this became the favorite of the two timelines for us. Simone St. James does a good job balancing a mystery with the supernatural that surprised some of us with how much we enjoyed the ghost story to this one. Things got really quiet amongst us as we learned of the ghost that haunts the school and at times all that could be heard was the faint sound of “I will survive” playing from the coulee. Towards the end is where we started to split into different sides of the coulee. For some of the TS, there was just too much going on in this story for them and they felt it didn’t pull together well enough to leave them completely satisfied. For me and the rest of the TS we thought everything tied together well and we were completely satisfied in the end. We highly recommend! Thank you so much to NetGalley, Berkley Publishing Group and Simone St. James for a copy to read and review. I’m weary of thrillers. I’m not a fan of ghost stories. And, bad girls in boarding school has been done to death. Sounds like a recipe for a disappointing read but Broken Girls was a pleasant surprise. The four “bad” girls in 1950 weren’t bad by today’s standards, in fact they weren’t bad at all. Mostly, these girls were shuttled off to a crumbling and severe boarding school to shield their parents from embarrassment and then a student goes missing. Everyone was afraid at Idlewild Hall even the I’m weary of thrillers. I’m not a fan of ghost stories. And, bad girls in boarding school has been done to death. Sounds like a recipe for a disappointing read but Broken Girls was a pleasant surprise. The four “bad” girls in 1950 weren’t bad by today’s standards, in fact they weren’t bad at all. Mostly, these girls were shuttled off to a crumbling and severe boarding school to shield their parents from embarrassment and then a student goes missing. Everyone was afraid at Idlewild Hall even the teachers but why and of what? This was a story of tragedy, of death, of girls seeking love and finding it with one another in a boarding school in Vermont. It was a story with Gothic overtones that kept this reader totally engaged from the very first page unto its satisfying conclusion. What better way to get rid of a daughter, a young girl, or a family problem, than to shut her away in a boarding school far from others and seldom visit or even care about her? The girls we meet are just such girls, not wanted by their families, considered problems, destined to be hidden among the somewhat ruins of a dilapidated school that has a history of a young woman's ghost haunting its environs. These four young girls carry secrets, things done to them that they had no control over and when one of them goes missing, their lives are irreparably changed. This book follows two time spans, one fifty years ago where we meet four of the girls at Idlewild Hall and one in the present. We met Fiona Sheridan whose sister was murdered and left on the grounds of the now abandoned Idlewild School grounds in 1994. Unable to ever forget what happened to her sister, Fiona, becomes involved once again when a mysterious benefactor decides to rebuild the school. Fiona, a small town reporter, decides to write a story about the school and events take a macabre and sinister turn as Fiona and her boyfriend, a local policeman, become involved in the stoy of the girls from fifty years ago. What happened at Idlewild Hall and who was this Mary Hand who seems to haunt the grounds, the buildings and the lives of those who traverse the environs of this school both now and in the past? What happened to her sister and is the man who is in prison for her murder the real killer? This was a wonderful thriller that possessed all the elements to make it so. Ms St. James has created a book that combines the ideas of murder, eerie surroundings, and a ghost to make a truly mysterious and scary novel. I recommend it most highly to those who want to read such a well constructed story that will have you turning pages into the dead of the night. I enjoyed this SO MUCH MORE than I expected to. Wow. What a surprisingly spooky read. Definitely going to add a million Simone St. James books to my tbr now bc I think I’m obsessed? THE BROKEN GIRLS was an amazing book, combining many elements I love: mystery, ghost story, historical fiction, dual time periods, and crime drama. I loved it – yes, it was dark and unsettling, but I was glued to the pages. The story alternates between the early 1950s and 2014 in a tiny Vermont town. In the past, four teenage girls attend a local boarding school for troubled girls called Idlewild Hall when one goes missing; in the present, a journalist named Fiona investigates the death of her si THE BROKEN GIRLS was an amazing book, combining many elements I love: mystery, ghost story, historical fiction, dual time periods, and crime drama. I loved it – yes, it was dark and unsettling, but I was glued to the pages. The story alternates between the early 1950s and 2014 in a tiny Vermont town. In the past, four teenage girls attend a local boarding school for troubled girls called Idlewild Hall when one goes missing; in the present, a journalist named Fiona investigates the death of her sister whose body was found on Idlewild’s abandoned property two decades earlier. Fiona agrees to write an article on the restoration of Idlewild when it’s purchased by a mysterious buyer. During renovations, a shocking discovery pulls Fiona into the unsolved case of the missing girl. Will it also lead her to answers about her own sister’s death? This was an atmospheric and creepy read, with some definite chilling moments. Like many Gothic novels, the house, Idlewild, was a haunted, complex character itself, and the tale of its resident ghost was heartbreaking. The mystery was complicated, and I enjoyed how the well-researched historical elements were woven into it. I love Simone St. James’ storytelling, and I’d recommend this book to anyone who likes a spooky story full of emotion and depth. A haunting mystery filled with the perfect amount of chills and thrills! Mary Hand Mary Hand, Dead and buried under land. She’ll say she wants to be your friend. Do not let her in again. This book was a bit of a genre potpourri.... a dose of mystery, a measure of thriller,a shot of historical fiction, a sprinkling of the paranormal, and a pinch of romance! All these genres were blended seamlessly creating one heck of a book! This book definitely caught me by surprise, I really was not expecting t A haunting mystery filled with the perfect amount of chills and thrills! This book was a bit of a genre potpourri.... a dose of mystery, a measure of thriller,a shot of historical fiction, a sprinkling of the paranormal, and a pinch of romance! All these genres were blended seamlessly creating one heck of a book! This book definitely caught me by surprise, I really was not expecting to like it quite as much as I did... I was completely entranced by the words on the pages throughout this entire book... bravo Simone St. James! 2014 Fiona is still haunted by the murder of her older sister Deb... still uncertain that the right person was convicted of The crime and still drawn to Idlewild Hall where her sister’s body was found... when somebody begins to renovate Idlewild Fiona is driven to write a story about the renovation.... but as she begins to dig into the history of Idlewild she finds herself with more questions than answers... what I love most about this part of the story was Fiona herself, she was so fierce and determined, I could just feel her love for her sister coming off the pages! Two very different stories woven together with threads of Idlewild Hall, Family, friendship, love, and a ghost... I really enjoyed both storylines equally... I was mesmerized by the past and compelled by the present... so many twists and turns that took me by surprise... so many times during this book I found myself literally sitting on the edge of my seat.... all the characters in this book were so well developed, so real, I felt as though I would know them if they were walking down the street.... although I must admit Fiona was my favorite, I really had a soft spot for her and really wanted her romance with Jamie to work out! Don’t panic if you don’t like romance, this was a very small part of the story, but I thoroughly enjoyed it! A captivating and compelling story that I would absolutely recommend to anyone who enjoys a good thriller! Don’t let the ghost scare you off! The Broken Girls by Simone St. James is a mystery/thriller read that has supernatural elements to it. Told in alternating timelines from several points of view the books was still easy to follow and one that will captivate the reader on the mystery side but give chills with the ghostly elements. In 2014, Fiona Sheridan is a journalist who was once touched by tragedy when the body of her sister was found. Her sister’s boyfriend at the time was tried and convicted of the murder but Fiona has never The Broken Girls by Simone St. James is a mystery/thriller read that has supernatural elements to it. Told in alternating timelines from several points of view the books was still easy to follow and one that will captivate the reader on the mystery side but give chills with the ghostly elements. In 2014, Fiona Sheridan is a journalist who was once touched by tragedy when the body of her sister was found. Her sister’s boyfriend at the time was tried and convicted of the murder but Fiona has never thought the details sounded right and has always questioned just what happened that horrific night. When Fiona finds out that the nearby Idlewild Hall is going to be restored she decides to run a piece on the property that was once a boarding school for troubled teen girls. There have always been rumors and ghost stories flying around about the property and now with the current renovations a discovery has been made that sends Fiona’s investigation back to the past. In 1950 at Idlewild Hall four of the troubled girls that reside at the school bond together and become friends. Katie, Sonia, Cece, and Roberta have heard about the mysterious lady in black that is supposed to haunt the grounds of Idlewild Hall but then one of the girls goes missing and the adults are writing her off as a runaway. The writing within The Broken Girls was wonderful and it didn’t take long to become fully engrossed in the story. The changing timelines and alternating points of view were easily followed as the layers of the story unfolded. Whether one believes in ghosts or things that go bump in the night or not this is sure to be one that will still entertain readers from beginning to end. When finished I’d definitely recommend checking out the haunting mystery. About: The Broken Girls is a thriller written by Simone St. James. It will be published on 3/20/18 by Berkley, an imprint of Penguin Random House, paperback, 336 pages. The genres are paranormal, fiction, suspense, gothic, and thriller. My Experience: I started reading The Broken Girls on 2/11/18 and finished it on 2/23/18. This book is a fantastic and thrilling read right from the first page! I literally bite my teeth and take shallow breaths as I devour the pages in this story. 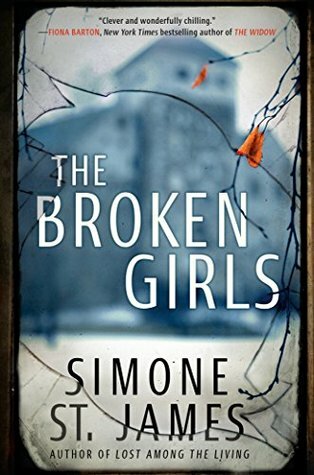 I couldn’t put About: The Broken Girls is a thriller written by Simone St. James. It will be published on 3/20/18 by Berkley, an imprint of Penguin Random House, paperback, 336 pages. The genres are paranormal, fiction, suspense, gothic, and thriller. My Experience: I started reading The Broken Girls on 2/11/18 and finished it on 2/23/18. This book is a fantastic and thrilling read right from the first page! I literally bite my teeth and take shallow breaths as I devour the pages in this story. I couldn’t put down every time I pick up this book and I’m angry that this month I couldn’t read in peace because there is always something that needed my attention. I like finding out the secrets of each characters. I like the mystery and suspense. The bit of ghost story really got my heart racing. I like the two timelines. I love the friendships. I like how radio was the thing to be cherished of the past. This book is set in Barrons, Vermont, told in the third person point of view following Katie, Roberta, Cece, and Sonia in 1950 and Fiona in 2014. The four girls are all 15 years old and they are roommates at Idlewild Hall, a last resort boarding school for girls. One thing that keep them up at night is the ghost story about Mary Hand and their friendship. There is a rumor that the school is haunted by Mary Hand and past students jot down their own experiences with her in school textbooks for future students. Each of the four girls has their own dark secrets that placed them at the school. In the present day, Fiona, a journalist is writing a story about Idlewild Hall because Margaret Eden wanted to restore the abandoned school. Fiona’s grief over the murder of her sister Deb from 20 years ago is always alive because her body was found on the sports field of the school. Even though Deb’s boyfriend is charged for her murder, Fiona just couldn’t figure out how he could’ve done it. She too had heard of the school being haunted but never believed it. As the construction begins to restore the school, Fiona scored an interview with the owner’s son Anthony, to tour the school for her news article. As they were touring the school grounds, another body was discovered. Soon, a whole web of secrets are to be unraveled. This book is very well written. I like the history and the background of each character. I feel for each character and they all are unique. I resemble Cece because big fat tears fall down my cheeks as I read Sonia’s background. I like Fiona and how she doesn’t give up despite people around her seems to do so. I like her chase to find the answer and her commitment to learn the truth. I feel tense and thrill reading this book. Every chapter kept me hooked and it was hard for me to put it down. I love the ending. I love the prologue and epilogue. I love the big reveal. This book is an excellent thriller and I highly recommend everyone to read it! ***Disclaimer: Many thanks to Berkley Publishing Group for the opportunity to read and review. Please be assured that my opinions are honest.